THE FINAL SPRINT: The Dodgers take on the Rangers in the second-to-last home date at Camelback Ranch this spring and the club’s final night game in Arizona. The Dodgers and Rangers tied, 3-3, all the way back on March 4 in Surprise. Following tonight’s contest, the Dodgers have two games left in the Phoenix area prior to the Freeway Series, which begins Thursday night at Dodger Stadium. Opening Day, April 4 against the Padres in San Diego, is just one week away! I was beginning to wonder if the Kings were going to hold a Dodgers Pride Night this season. Then, on what seemed like extremely short notice, word spread on Thursday that the upcoming Saturday game against Edmonton would be the day. The Kings would honor the city with some Dodger Pride, and this would be highlighted by some fantastic Dodger duds on the ice. Thankfully, I was there, so here is my brief report on the festivities. As you may already know, this evening is all about the pregame skate. Over, at least, the past three years the Kings would head onto the ice for their pregame skate wearing Dodger-themed hockey jersey's. [Go here to see my past reports: (2012-13) (2013-14) (2014-15)] This meant the Kings in Dodger Blue. However, we got a bit of a change this season. The Kings came out wearing Dodgers "Home-Whites" on the ice. Check out a bunch of my pics below. Click on any photo to embiggen. This past Saturday was Dodgers Pride Night at the LA Kings game, and I was there to take it all in. Later today I hope to have a bunch of pics I took from the evening; including a brief look at the pregame Dodgers-themed Kings jersey's they sold at auction. 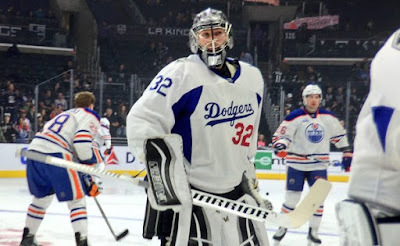 Featured above is Kings goalie Jonathan Quick in Dodger "Whites," pic via the Kings on twitter. Via David Krell at the Sports Post, "Durocher, Drysdale, and the Duke." David takes a look at short Hollywood careers of several Dodger players. Via Eric Stephen at True Blue LA, "Dave Roberts owes Kenta Maeda a nice dinner."